The Belgian artist Rysselberghe was an enthusiastic promoter of modern art in his own country and in 1883 he founded, together with the writer Octave Maus, the avantgarde group Les Vingt. Many of the great names of post-Impressionism took part in their annual exhibitions. As a painter, his most decisive experience was a trip to Paris in 1886 in the company of his friend the poet Émile Verhaeren, which enabled him to admire Seurat's Grande Jatte. 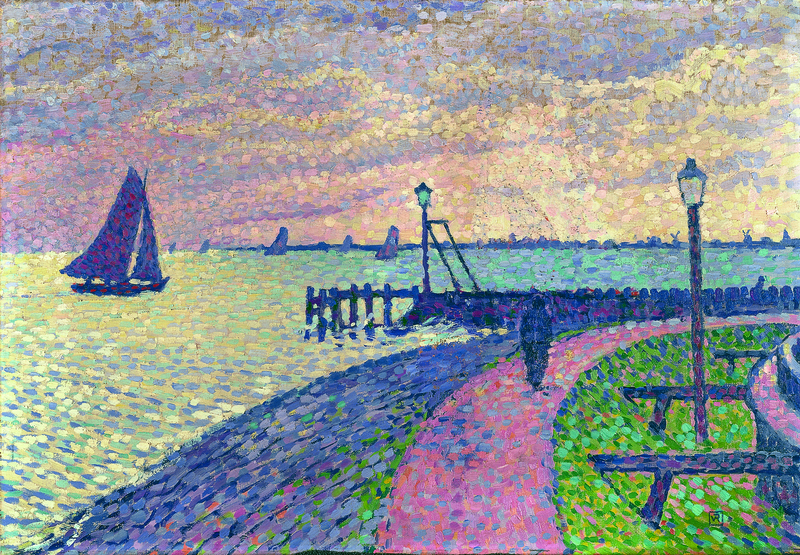 He befriended Signac and in 1889 he adopted the divisionist technique, which he exercised until the end of the first decade of the 20th century. Rysselberghe was particularly renowned for his portraits, in which he combined a neo-Impressionist execution with the naturalist conventions of this genre, with clear references to Manet, Degas and Whistler. His compositions of figures, in indoor or open-air scenes, constituted an eclectic and refined model for the diffusion of Pointillism in Europe at the end of the 19th century. But the section of Rysselberghe's oeuvre of interest to us today is primarily composed of his landscapes, like this delicate view of a small Dutch port. Volendam is an old fishing village, 18 km northwest of Amsterdam, with small wooden houses, all different from each other (today it is a highly profitable mass attraction). However, Rysselberghe avoids the anecdotal or picturesque details (the village itself does not appear in the image) in order to construct, with a few essential lines, a synthetic and almost abstract composition. 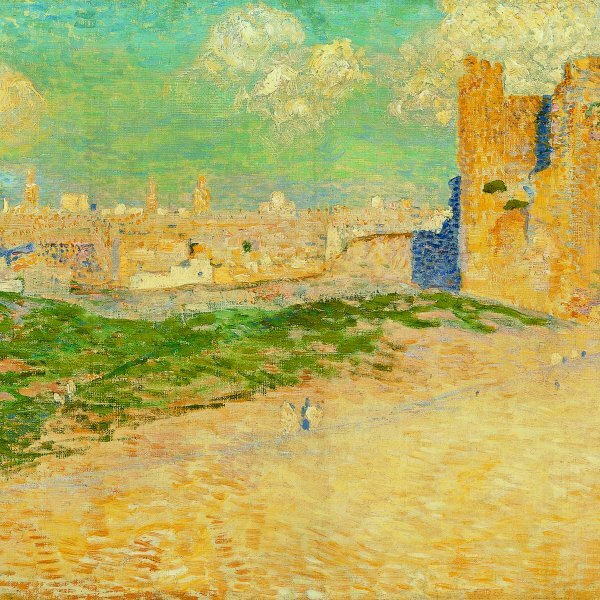 The choice of the subject and its interpretation is typical of neo-Impressionism: Seurat, Signac and Cross chose French harbours as the subject of their best landscapes. By excluding the hustle and bustle of Impressionist open-air scenes, Seurat's ports seemed still, deserted, surrounded by a disturbing silence which foreshadowed metaphysical painting. Some of Seurat's rigour, although somewhat mellowed, can be felt in the structure of Rysselberghe's painting: a web of horizontal and vertical lines in which the dynamic curves of the foreground are inscribed. The device of using the sailing boats to mark the perspective, which imposes on the painting an almost musical rhythm, also appeared in Signac's seascapes (and certainly, many years before that, in Caspar David Friedrich). But, in contrast with Signac, who in that period emphasised the intensity of his blues, reds, greens and yellows, Rysselberghe was a poet of "shades" rather than colour, as Verlaine advocated in a famous poem. The painter used a limited range of colours, with subtle variations of pink, blue, green and mauve, thus creating a dialogue between the filtered light of the sky, the sea and the land, and wrapping the whole in a delicately melancholic atmosphere.